Women’s History Month is approaching again! International Women’s Day, celebrated globally on March 8th, is a time to celebrate women’s achievements, recognize challenges, and focus greater attention on gender equality. The United Nations began celebrating IWD in 1975, and this year the UN plans to use the holiday to highlight the Beijing Declaration and Platform for Action, a roadmap signed by 189 countries 20 years ago that laid out the plan for advancing women’s rights. Though there have been many achievements in the past 20 years, they hope to galvanize action to address the equality gaps that still remain. SBAI will be celebrating with our annual International Women’s Day Field Trip on Friday, March 6 to The National Women’s Rights Historic Park in Seneca Falls, NY. 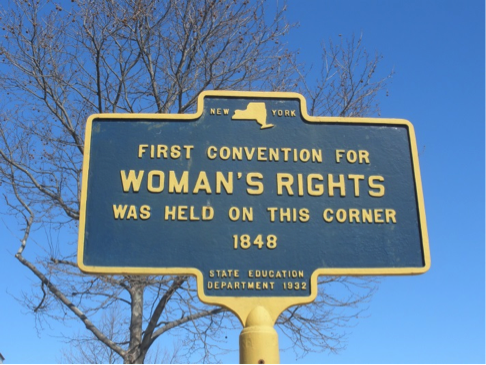 See the site of the first US women’s rights convention where Elizabeth Cady Stanton and Lucretia Mott spoke, tour the Park museum, or stop in and shop at Women Made Products. This trip is free and includes transportation, admission, and lunch! Registration is open to the greater University community. RSVP is required by Monday, March 2. RSVP to sbai@rochester.edu. Please note that if you RSVP you are required to attend the trip, as all expenses are prepaid. This entry was posted in SBAI Events and tagged #internationalwomensday, #women'srights, #women'srightsnationalhistoricpark, #womenshistorymonth. Bookmark the permalink.